IMPROVED SKIN TONE: Vitamin C serums can brighten age spots and hyper-pigmentation, or discoloration of the skin. The vitamin C serums act as a natural bleaching agent and lighten the skin, including age spots and dark circles under the eye. In addition to brightening skin, Vitamin C serums can prevent mild redness associated with sun damage. SKIN PROTECTION: Vitamin C serums offer some protection against UV rays. However, vitamin C is a weak sunscreen and should be used in conjunction with a traditional SPF. Vitamin C is also known to repair some signs of sun damage, such as discoloration and fine lines. It's the potent antioxidant properties of vitamin C serums that are responsible for reversing some signs of aging and reducing age spots. ANTI-AGING EFFECT: A facial serum is not the same as a facial moisturizer, and most cosmetic skin-care lines offer (and recommend) both. A serum, often lighter and thinner in consistency compared to a moisturizer, is applied to the face after cleansing, and before the moisturizer. LOOK YOUNGER: No matter what your age, it's always a good idea to be preemptive about avoiding wrinkles, sagging skin, fine lines, and other signs of aging. Vitamin C can help your skin look younger for longer, not only by stimulating collagen production, but by evening out your skin tone and brightening your complexion as well. VITAMIN C HISTORY: Vitamin C has become an increasingly popular ingredient in cosmetic skin-care products. In 1992, Dr. Sheldon Pinnell of Duke University published the results of a study that proved the vitamin-C form of L-ascorbic acid reduced sun damage. This launched further studies that proved vitamin C's other positive effects on the skin. 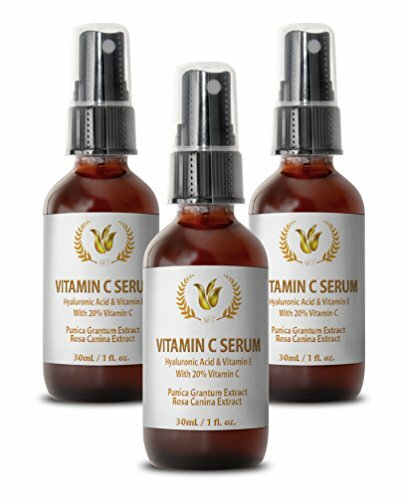 Now, in the cosmetics world, vitamin C is a star ingredient in facial serums. COLLAGEN BOOSTER: One of the main benefits of vitamin C products is that its highly concentrated levels of vitamin C help to boost collagen production. As a result, your body can produce more collagen, which can help to fill in fine lines and wrinkles. As a result, you may find that you have more youthful looking skin without the need for any expensive and potentially risky cosmetic work! FORMULA: Is a safe formula, which is very beneficial for: improving your skin & giving it a youthful glow, reducing and preventing wrinkle formation, fading appearance of sun spots and discoloration, protecting your skin and preventing its premature aging, minimizing and eliminating existing wrinkles, as well as for refining skin texture.